Horton The Elephant struggles to protect a microscopic community from his neighbours who refuse to believe it exists. A young man wishes he could get away and his wish is granted in a globetrotting, song-singing way. Visit the magical island where Mr. Hoober-Bloob sends babies to Earth in his own musical way. 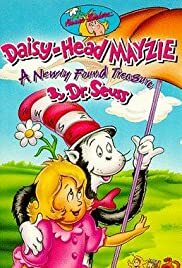 Daisy-Head Maizie, both as a story and an animated adaptation, may not be the best of Dr Seuss, but for someone relatively new to the story and as someone very fond of Dr Seuss it was treat. The animation is bright and colourful, with every background and character drawn simply but elegantly, while the whimsical scoring and cheery songs are also winners. The writing respects Dr Seuss' style with the dialogue, rhymes and song lyrics witty and bouncy. What's also great is how well you makes you laugh and cry without being too forceful. The story may be somewhat slight and sentimental, but also undeniably charming and fun, the sort of story you get more out of on subsequent viewings. The characters are memorable and engaging, and the voice acting is terrific, Henry Gibson and Tim Curry in particular standing out.